In plumbing pipes, water flowing from a drain to the sewer creates the same type of negative pressure as sipping through a straw. Additionally, negative pressure can slow or stop the flow of drain water, or empty standing water from P-traps found on sinks, showers, and tub drains. This is why every home plumbing system includes a network of vents. You may have thought that the vents are there to allow sewer gases to dissipate, and although they do that, that isn't their primary function. It's safe to say your drain and waste system wouldn't function correctly if the vents weren't there to allow air into the pipes and equalize pressure. Without venting, P-traps would lose their water and be useless. The plumbing system design that serves every residence in North America and in most other parts of the world was largely perfected in the 19th century. The P-trap was one of the most important inventions. The curved piece of drain pipe you see connected to every drain in the house holds a reservoir of water that acts as a barrier preventing sewer gases from escaping into your home. The problem with early traps, however, was that they had a habit of emptying whenever water was poured down the drain. Plumbers theorized that adding a pipe to each drain to allow outside air to enter into the system would correct this problem, and in 1874, the Venting Theory was proven. Since the achievement of this milestone, a home drain network is not just a drain-and-waste system, but is known as a drain-waste-vent (DWV) system. The main vent stack usually extends through the roof above the main bathroom. The main part of a household vent network is the main stack, which typically serves the main bathroom. It extends downward to the sewer and upward through the roof, terminating in a pipe that typically extends one or two feet above the roof line. If you think of this main vent as the trunk of a tree, you can visualize all the smaller vents as branches that extend out from the trunk to the various fixtures, such as toilets, sinks, showers and washing machine connected to it. According to the plumbing code, the main vent must be at least 2 1/2 inches in diameter if it serves more than two drainage fixtures, which most household vents do. The diameter of the main vent on a typical single-family dwelling is usually 3 inches, or sometimes 4 inches. The diameter of the pipe forming each branch vent depends on the diameter of the trap it serves and its total length. Common diameters are 1 1/4, 1 1/2 and 2 inches. Branch vents can run horizontally, but the code stipulates that each must have a minimum slope of 1/4 inch per foot toward the drain. The code also specifies the connection point for each fixture vent. It must be at least 6 inches above the flood level of the fixture it serves and can be no more than a specified distance from the trap, depending in the diameter of the vent. For example, a 1/14-inch vent can be connected no farther from the trap than 5 feet. For a 2-inch pipe, the distance increases to 8 feet. An island sink is typically vented by a Chicago loop. Although the code requires each fixture to have its own connection to the atmosphere via the main stack, it allows circuit venting in some situations. In this configuration, a maximum of eight fixtures can connect to the same horizontal vent pipe leading to the main stack. Different circuit vents can be connected, together which provides a venting solution for buildings with a large number of fixtures, such as an apartment building. A basic venting network may not serve the needs of every fixture. 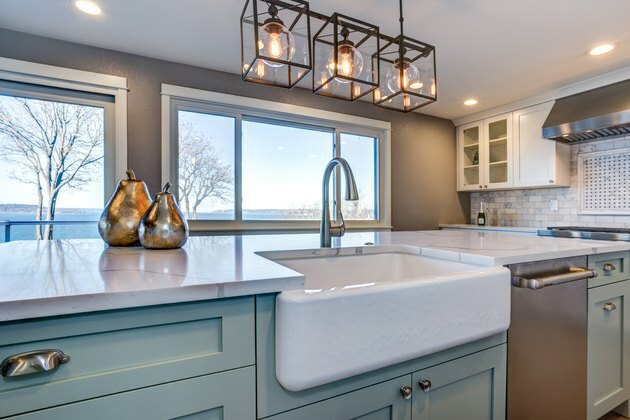 For example, an island kitchen sink needs a special configuration, since it is impossible to run horizontal pipes to a level above the flood rim. The answer to the dilemma is a configuration known as a _Chicago loop—_a length of vent pipe under the sink that forms a loop above the flood rim and then drops to the floor, where it extends horizontally to connect to the main stack. The code also allows drain pipes to be used as vents for individual fixtures in some cases. These are called wet vents. AAVs are mechanical devices that can take the place of a conventional vent connection on a sink drain. Also called Studor valves, AAVs aren't legal everywhere, so it's important to check local codes before installing one. When installed properly, an AAV opens when water is flowing to allow air into the pipe and equalize pressure. One disadvantage of AAVs is that they wear out and may get stuck in the closed position. In cold climates, ice and snow are frequent causes of vent blockages. Repeated efforts to clear the drains have no effect. You hear gurgling sounds coming from one drain while water is flowing down another one. The gurgling is the sound of air being sucked from the P-trap. You notice sewer odors. They indicate that negative pressure in the drains has emptied at least one fixture P-trap. The procedure for clearing a vent depends on why it is blocked. It may involve little more than clearing debris from the vent opening or deicing it. But it usually takes a plumber to clear a vent obstruction in a branch vent.